News & Events Archives - miningchutes.com , 2014, Clayton Equipment has nominated Variant to be the exclusive supplier, service provider, and North American manufacturer for their premiere line of electric and diesel mine locomotives for the Canadian and US mining industry. Clayton Equipment Ltd is a leading manufacturer of rail haulage solutions, predominantly focused on battery, trolley and diesel locomotives for mining and tunneling applications. Throughout the world you will find Clayton equipment operating in the most arduous conditions. Whether it is hauling on the surface or deep below ground, Clayton machines move equipment, materials, personnel and ore in over 60 countries. Clayton has manufactured over 5000 locomotives in their 80 plus year history, remaining at the forefront of the industry by setting the standard in innovation, safety, reliability and longevity. Combined with Variant Mining Technologies’ existing line of VMT rail and truck loading chutes, trough conveyors, vibratory feeders and other custom material handling machinery, Variant and Clayton are capable of providing hard rock and soft rock mines with complete ore handling and rail haulage systems. For more information on Variant Mining Technologies and Clayton Equipment, please visit their respective website. www.variantmining.com www.claytonequipment.co.uk1 Variant Mining Technologies is pleased to announce that, effective May 31st, 2014, Clayton Equipment has nominated Variant to be the exclusive supplier, service provider, and North American manufacturer for their premiere line of electric and diesel mine locomotives for the Canadian and US mining industry. Clayton Equipment Ltd is a leading manufacturer of rail haulage solutions, predominantly focused on battery, trolley and diesel locomotives for mining and tunneling applications. Throughout the world you will find Clayton equipment operating in the most arduous conditions. Whether it is hauling on the surface or deep below ground, Clayton machines move equipment, materials, personnel and ore in over 60 countries. Clayton has manufactured over 5000 locomotives in their 80 plus year history, remaining at the forefront of the industry by setting the standard in innovation, safety, reliability and longevity. Combined with Variant Mining Technologies’ existing line of VMT rail and truck loading chutes, trough conveyors, vibratory feeders and other custom material handling machinery, Variant and Clayton are capable of providing hard rock and soft rock mines with complete ore handling and rail haulage systems. For more information on Variant Mining Technologies and Clayton Equipment, please visit their respective website. 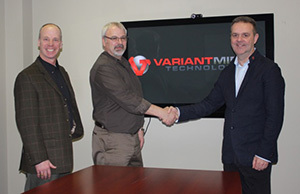 www.variantmining.com www.claytonequipment.co.ukVariant Mining Technologies is now a proud member of the Greater Sudbury Chamber of Commerce. See the latest in vibratory feeding technology. Share the excitement with us on Wednesday, November 28, from 9:00 am to 3:00 pm. We would like to offer you the opportunity to see a demonstration of the new Variant Mining Technologies vibratory feeder system. Our staff will be standing by and pleased to provide a personal tour. Light refreshments will be served.Variant Mining Technologies is now a proud member of the Greater Sudbury Chamber of Commerce.